2-Point control, or a 3-way, couldn't be simpler to automate with our new S2 ZEN26 and ZEN27 wall switches. Just locate the box with power and neutral in it and install the device according to one of the diagrams below. How do you find direct connection to power? The easiest way is to locate a black wire bundle and white wire bundle in the back of your multi-gang box. If you're dealing with single boxes only, you'll need to measure voltage on the black leads coming into each box in a 14-2 romex. Still not sure what you're looking for? Send us a few pics and we'll help! A 3-way is what we call 2-point control so 2 different switches controlling the same set of lights. These instructions can only be used with ZEN26 and ZEN27, if you have ZEN21, ZEN22, ZEN23, ZEN24 VER. 2.0 switches, please click here for 3-way wiring diagrams. Always use simple on/off 3-way switches when connecting them to Zooz switches. No dimmers or electronic switches with a LED indicator may be wired to Zooz switches or dimmers. There are many different types of 3-way switches, some will have common terminals on top of the switch, some on the bottom. Always locate the common terminals first and adjust the orientation of the wires accordingly. Don't follow the diagrams blindly. Once you're 100% sure you've identified the wires, please make sure power is off and wire the Zooz switch according to the instructions below. 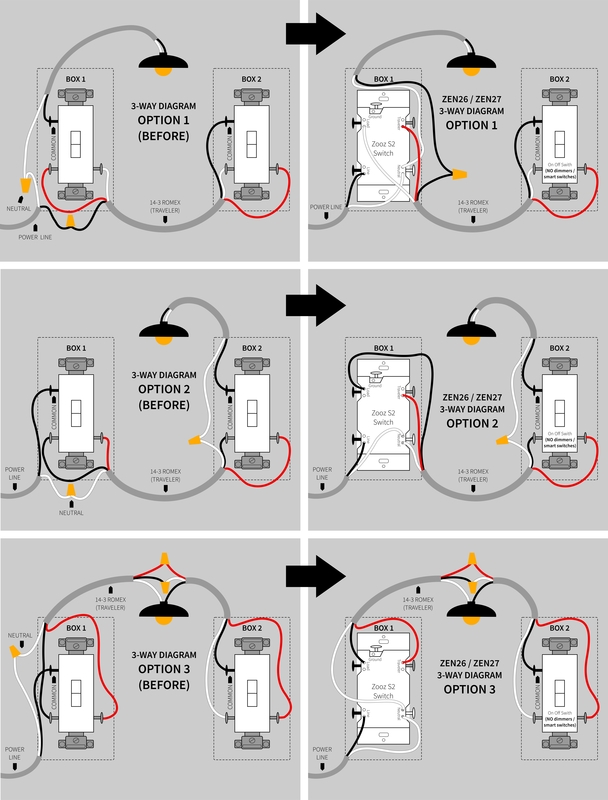 These diagrams illustrate the most common 3-way set-up. But there are other creative wiring scenarios for 2 switch controls so if you're not able to match yours with the below "before" drawing, please don't pick the closest option. Trial and error are not a good idea with high-voltage installations. Instead, reach out to us first for custom instructions.